Once per turn, you can also Xyz Summon “Zoodiac Drident” by using 1 “Zoodiac” monster you control with a different name as Xyz Material. (If you used an Xyz Monster, any Xyz Materials attached to it also become Xyz Materials on this card.) This card gains ATK and DEF equal to the ATK and DEF of all “Zoodiac” monsters attached to it as Materials. Once per turn, during either player’s turn: You can detach 1 Xyz Material from this card, then target 1 face-up card on the field; destroy it. The second best card of the year and we are back to Raging Tempest and the Zoodiac archetype. Oddly, the only Zoodiac Xyz to make the list, yes Broadbull isn’t on the list, but this guy at least made the list. The now banned Zoodiac Drident. Drident is a Earth Beast-Warrior, Rank 4, with ? ATK and DEF. I will explain more later. He needs 4 Level 4 Monsters, which isn’t happening. Drident is like all the other Zoodiac Xyzs. ATK and DEF is equal to Zoodiac monsters attached to it, can be Xyz Summoned only using 1 Zoodiac Monster, and can only be summoned like that once per turn. One card Xyz Summons was a bad idea, especially on cards as good as the Zoodiac monsters. No wonder this deck was Tier 0 and was one of the best engines in the game’s history. 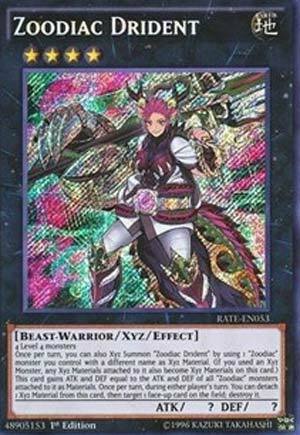 Not to mention the Zoodiac Xyzs and other Beast-Warrior Xyzs got effects from the main deck Zoodiacs. For Drident’s unique effect, you can detach a material during either player’s turn to destroy a face-up card on the field. This helped with Ramram to extend Zoodiac combos and it also annoyed the opponent by disrupting their plays. The best Xyz Zoodiac had access to, thankfully it is now forbidden. Zoodiac was the culmination of power creep for a generation. The mountain top. It was the last hurrah before Konami literally changed the general rules of gameplay. Zoodiac did things that no deck in any game should be able to do. It allowed for instant access to almost any card in your deck, graveyard, or extra deck, and all cards were replaceable in a moment. And while Ratpier was the enabler, Zoodiac Drident was the star. There’s no logic that can be applied to Drident. The effect is both generic and yet absurd, a multi-faceted tool that takes zero effort to summon and minor effort to win games by his lonesome. Now with the link rules, Zoodiac XYZ’s were no longer able to summon at will, which is what they were meant to do. The new rules almost felt aimed at Zoodiacs as a result, but knowing how these things work, it’s more like Konami squeezed Zoodiacs into the format before the already-designed rule changes took place. They threw a mythic dragon into the sky before killing it. But even so, what made Drident truly fearsome was that he was addable to nearly any deck. A small Zoodiac engine was thrown into anything and everything until all you saw for a while was other decks and “-Zoodiac” at the end of it. And it was all just to abuse Ratpier and Drident and win games like no set of cards that came before them. A worthy #2 that could very well have been #1 for 2017. Enjoy your long stay on the banned list, old friend.